The Air Force has been warning about its growing pilot shortage for some time. But a government report has found that the Air Force, Marine Corps, and Navy all have significant shortfalls. The service branches' stop-gap approaches have created additional problems for pilots, hurting quality of life and affecting retention, the report warns. Air Force officials have been warning about the force's dire pilot shortage, and a recent Government Accountability Office report illustrates just how bad the shortfall has gotten. The report assesses the gaps between the actual number of fighter pilots that the Air Force, Marine Corps, and Navy have and the number of positions they are authorized to have. Each service branch reported fighter-pilot shortages that have grown worse in recent years. "Service officials attributed these gaps to aircraft readiness challenges, reduced training opportunities, and increased attrition of fighter pilots due to career dissatisfaction," the report says. The Air Force had at least 92% of its fighter-pilot positions filled between 2006 and 2010, an 8% gap, and 104% of what it needed in 2011, a 4% surplus. But the gap has grown since 2012 and is currently the biggest of the three military branches, at 27%. The Air Force, which has undertaken a number of training and retention initiatives, projected its shortfall to last through fiscal year 2023. Click through the gallery here to see images of the moves -- and then an explanation on how the pilots maneuvered them.  Each branch has different levels at which the difference between authorized positions and actual staff levels becomes a shortage. Air Force officials told the GAO that "their established practice is that pilot communities with less than 100 percent of authorizations are considered to be insufficiently staffed." "According to briefing documents prepared by the Air Force, this gap is concentrated among fighter pilots with fewer than 8 years of experience," the report notes. Air Force officials told the GAO that between 2006 and 2017, "fighter pilot gaps were generally limited to non-operational positions, such as staff assignments at Air Force headquarters or combatant commands." 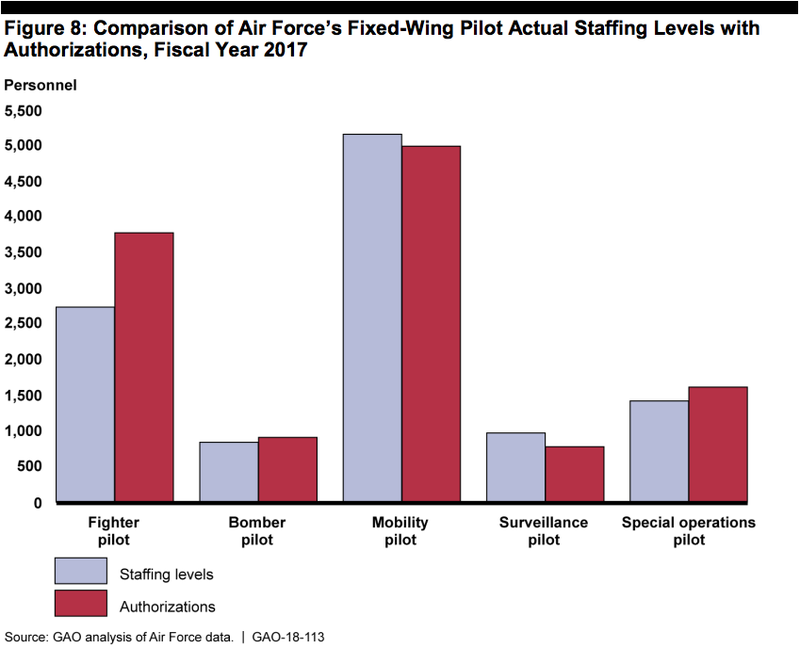 But the GAO also found that the Air Force had been unable to fill all its operational positions since fiscal year 2014, with the gap between the operational positions it needed to fill and the actual staffing levels it had growing from 39 pilots, or 1% of authorizations, in 2014 to 399 pilots, or 13%, in 2017. Several factors have contributed to these shortfalls, in particular reductions to overall active-duty military end strength. Service officials said that personnel reductions after the 2008 drawdown in Iraq and cuts to funding stemming from the 2011 Budget Control Act both helped reduce the number of fighter pilots in the military. The Air Force shed 206 fighter pilots in order to meet initial demand for pilots of unmanned aerial systems in 2011 and 2012 and then lost 54 more to early-retirement incentives in 2014 and 2015. That was compounded by changes to force structure — the decline in active and reserve Air Force fighter squadrons from 134 in 1989 to 55 in 2017 has reduced the opportunities newly trained pilots have to gain flying experience. These factors have helped create a bottleneck in the Air Force's training pipeline. 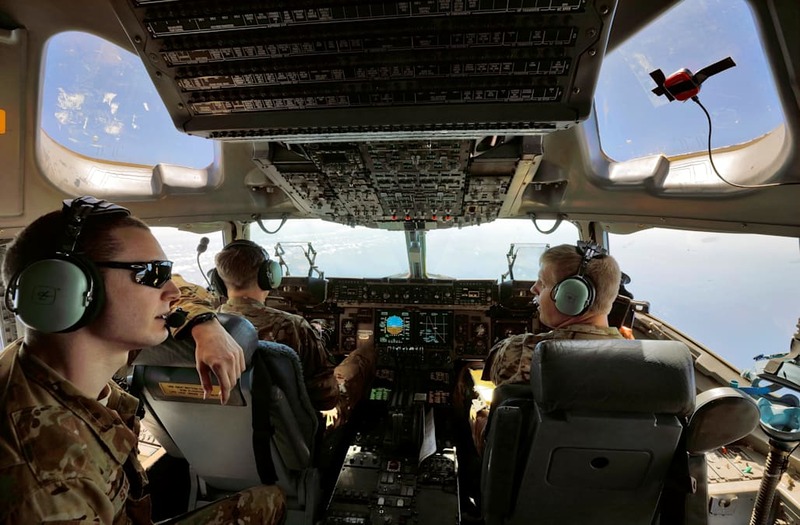 The service has more pilots entering than it has resources to train. According to the GAO report, between 2006 and 2017 the Air Force trained 12% fewer new fighter pilots than its target amount. "Fighter pilots told us that the need to prioritize the staffing of experienced pilots to deploying squadrons has limited the number of experienced personnel available to train newer pilots at home stations," the report says. A fighter pilot needs about five years of training to be qualified to lead flights, which costs between about $3 million to $11 million depending on the type of aircraft they're being trained to fly, according to Air Force officials. The services have also struggled to retain pilots. 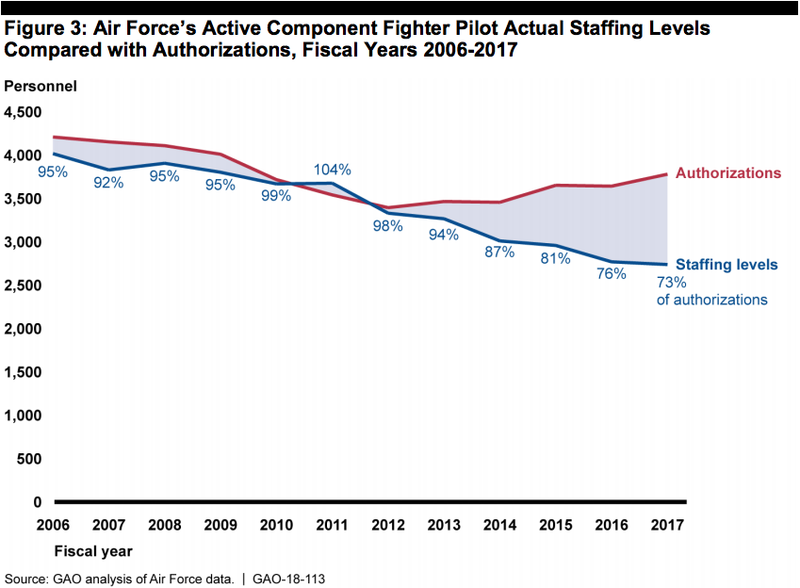 The GAO found that the number of Air Force pilots signing retention contracts fell from 63% in 2013 to 35% in 2017 — despite the service increasing its maximum aviation bonus contract to $225,000 at the start of 2013, which was the highest amount offered by any of the military service branches. Officials from the service branches told the GAO they had used various tactics to address their pilot shortfalls, including longer and more frequent deployments, putting senior pilots in junior positions, and "prioritizing staffing fighter pilots to flying positions that require fighter pilot-specific technical skills." The service branches has also tried to compensate for fighter-pilot shortages by drawing on pilots from other career fields. The Air Force, for example, has drawn on mobility pilots — those that fly cargo and refueling aircraft — to fill instructor roles for basic training to free up fighter pilots for duties elsewhere. A high operational tempo has limited the opportunities senior pilots have to train with junior pilots, which in turn limits the opportunities the service branches have to grow the number of pilots with specific qualifications.  This also cuts into the services' ability to rebuild readiness. Air Force officials said "high deployment rates ... have resulted in less time for squadrons to complete their full training requirements because high deployment rates mean that there are fewer aircraft available for training at home stations." Moreover, increasing individual deployments undercut family stability, pilots said, affecting satisfaction with their careers. The Air Force has taken steps to mitigate the effects the pilot shortage has had on pilots' quality of life. It has stood up teams dedicated to finding and implementing dozens of initiatives to reduce the fighter-pilot shortage. "For example, as the result of one initiative, 126 contractors have been placed in fighter squadrons to assist with administrative tasks and reduce workload for fighter pilots," the GAO notes. Air Force training squadrons have also taken steps to better apportion resources, including consolidating instructors among training units and altering the training process and syllabus, according to a February report by Aviation Week, but those shifts still put a strain on pilots and aircraft and represented "a leap into the unknown" for the units. The GAO report also noted that the service branches had not reevaluated fighter-squadron requirements to reflect change conditions, the increased workload, and the effects of the increasing use of unmanned aircraft. "Air Force officials told us that metrics that inform squadron requirements ... have not been increased because the Air Force is instead prioritizing the effort to recapitalize its fleet of fighter aircraft," the report said, adding that officials said they were also reassessing fighter-pilots' nonoperational requirements, focusing on finding which ones could be reassigned to other pilots. The report made recommendations for each branch, advising the Air Force to reevaluate those squadron requirements, "to include updating current assumptions of fighter pilot workload, and assessing the impact of future incorporation of [unmanned aerial systems] platforms into combat aviation."